The global smartphone industry witnessed a turning point last year, with manufacturers reorganizing their priorities to stand out and beat the market saturation, with either crazy specifications or even crazier designs, all to amaze consumers with something new and exciting. 2018 was evidently a year of experimentation. And, it was the year of the “notch.” Last year, the Internet was divided into lovers and haters of the trend. But despite the peak and then fall of the notch trend, brands continue to strive towards adding larger displays without increasing the smartphone footprint. While most manufacturers are trying to shrink notches further, some have also experimented with moving parts to accommodate the selfie camera. 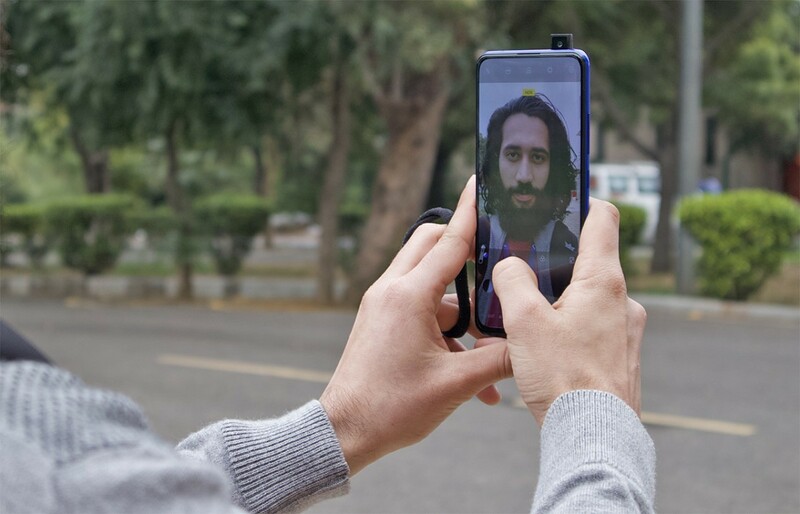 Vivo, which pioneered the concept of the retractable selfie camera with the Vivo NEX series, has been doing some homework to refine the concept. The result is the new Vivo V15 Pro which was launched in India. 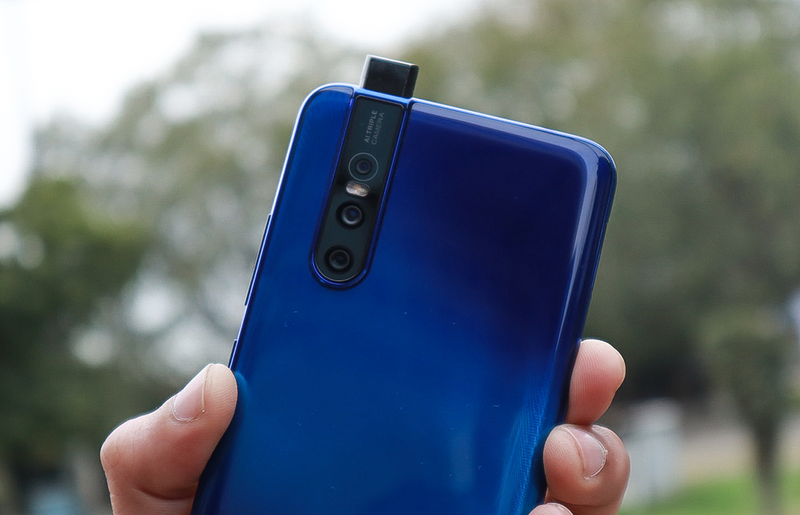 The device feels premium in almost all senses with its 32MP pop-up selfie camera, triple cameras on the back including a 48MP sensor, a tempting display, and a pleasing pattern on the back. After our first encounter with the smartphone at its launch in India, here’s what we feel are all the exciting bits about the Vivo V15 Pro. Availability Only available in India for ₹28,990. The Vivo V15 Pro is a slim device with shiny and rounded edges that sits comfortably in the hand. It feels lighter and offers more convenience of usage compared to other devices in the segment. The placement of the buttons is appropriate and you wouldn’t have to flex your fingers a lot to hit the right ones. While the right edge houses the buttons for volume control and power/lock and unlock, the left edge has an additional button which can be used to toggle Google Assistant and Vivo’s Jovi assistant which helps you find products using pictures. Apart from the buttons, the edges feature a micro USB port and separate dual SIM and storage expansion slots. By all means, the Vivo V15 Pro has a visually striking design, especially because of the “Spectrum Ripple Design” being used by Vivo. The back is very reflective and unravels a pattern varying with changing angles at which light falls on it. The blue variant uses fine lines to create a centrifugal pattern which appears to be made from a mixture of grains and ridges, furnishing a very amusing, vortex-like design. The red variant, on the other hand, uses a criss-cross of dark red lines over a relatively lighter shade of red to signify the sparkle of a ruby. At the launch event, Vivo decided to lock the red Vivo V15 Pro units away in transparent chambers of plastic (without a specific reason) with only the blue ones up for our initial inspection. 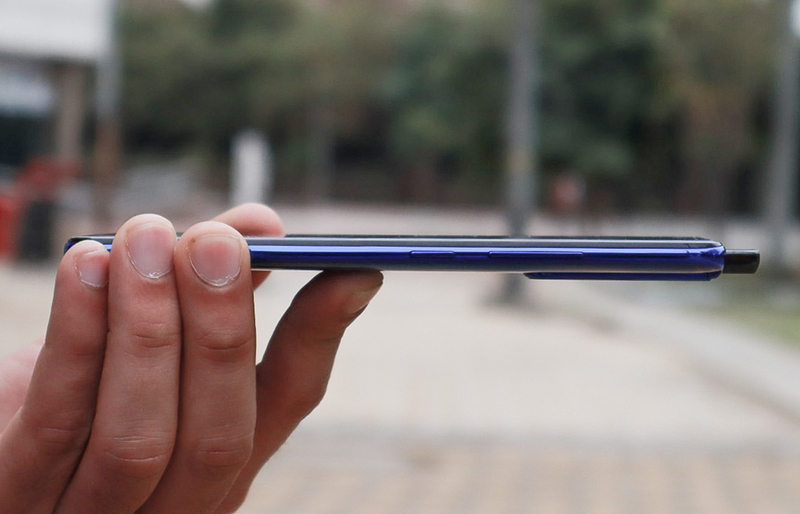 While the spiraling lines on the Vivo V15 Pro’s back are sufficient to turn heads, another aspect that makes the smartphone somewhat unique is the pop-up selfie camera. 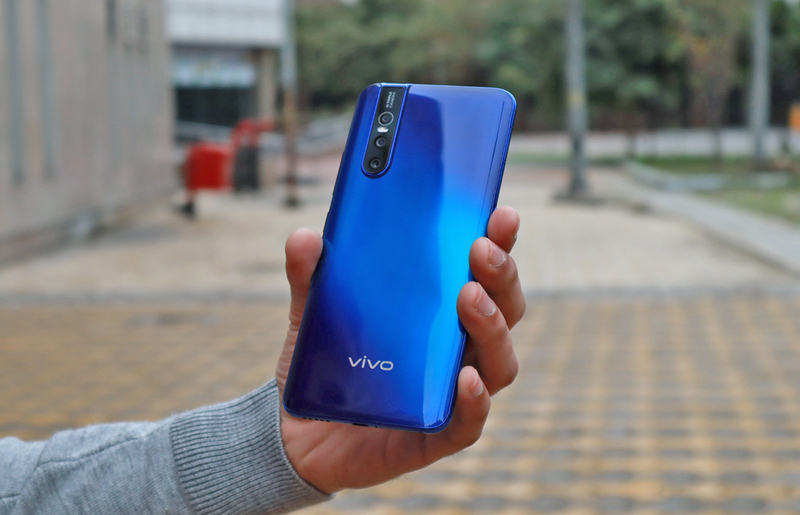 I have mixed opinions about the moving camera but if you’re wondering about its durability, Vivo guarantees that the camera can bear a force of up to 120kg and can be opened and drawn back into its cavity at least 300,000 times. This means that if you open and close it 100 times a day, the mechanism should stay intact without any wear for eight years. Besides controlling it electronically, a small but persistent amount of force is sufficient to push the camera inside and this ensures that the module does not suffer breakage due to accidental collisions. The pop-up camera is great for those who have been avoiding buying a smartphone with a notch. It helps in retaining the rectangular design of the display without any obtrusive parts that may cover the content of the screen. Other benefits of this familiar screen include a more immersive experience while playing games or watching video content. Thanks to the company’s choice of a pop-up camera, the Vivo V15 Pro has a screen-to-body ratio of over 91%. 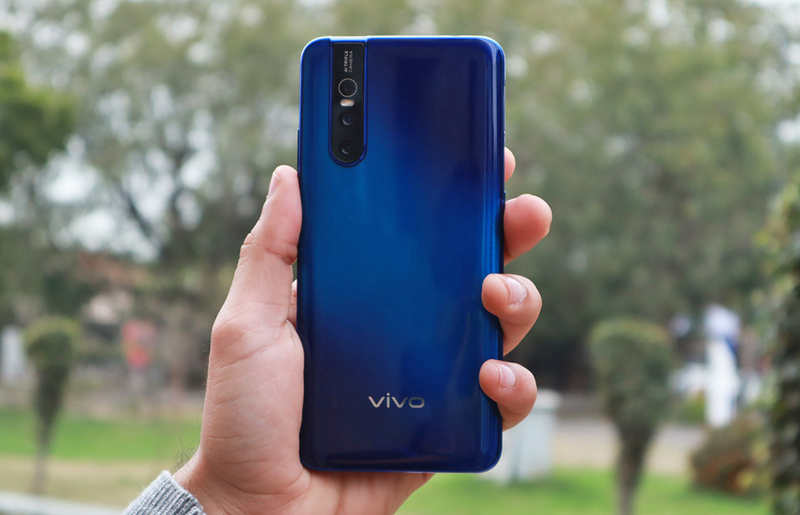 Vivo seems to have given ample thought and research into checking all the essential boxes with the Vivo V15 Pro and has especially been considerate when it comes to the display. The V15 Pro uses a Super AMOLED display, straying away from the company’s usual choice of LCDs. As a result, the display on the Vivo V15 Pro is sufficiently bright and vivid and feels more immersive when compared to an LCD. It also helps to maintain the thin profile of the smartphone. Besides that, the smartphone has very slim bezels, which really uplift the appearance of the device. 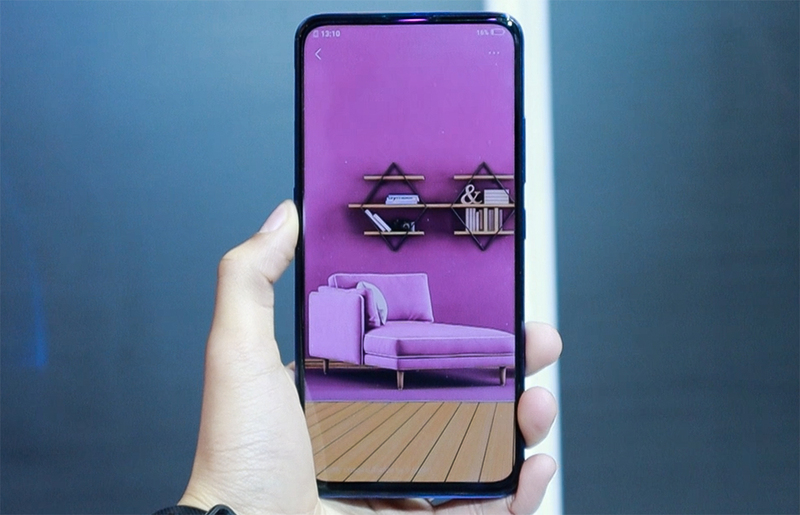 While the tallness of this display could be a problem, Vivo has added navigation gestures which are different, to say the least. There is a thin bar at the bottom, sliced into three parts, each of which designates the specified area per gesture. Swiping upwards on the part on the right works like the back button while the same action on the middle part emulates the home button. By dragging and holding the middle part, you can bring up the Recents menu. Lastly, by swiping over the left part opens the Quick Settings pane. If you’ve used Vivo phones before, you’ll be familiar with the fact that the Quick Settings are located at the bottom of the interface while the upper pane is exclusive to notifications. 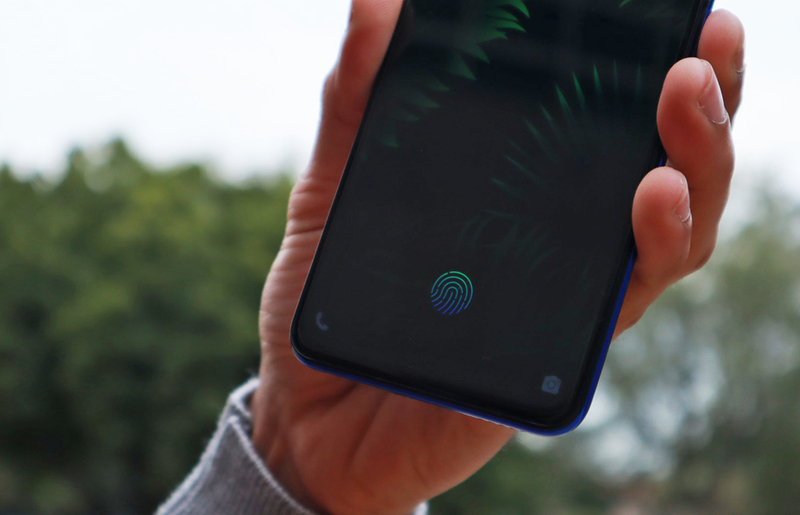 The display also houses the in-display fingerprint scanner, the fifth iteration since Vivo introduced the Vivo X21 UD last year. As per the company, this fingerprint scanner is faster and more secure compared to the previous generation and takes only 0.37 seconds to unlock the smartphone. Although impressive, this claim can only be verified once we receive a unit for review. The Vivo V15 Pro feels like it has an attractive and fulfilling design overall, but there are a few things that irk me. 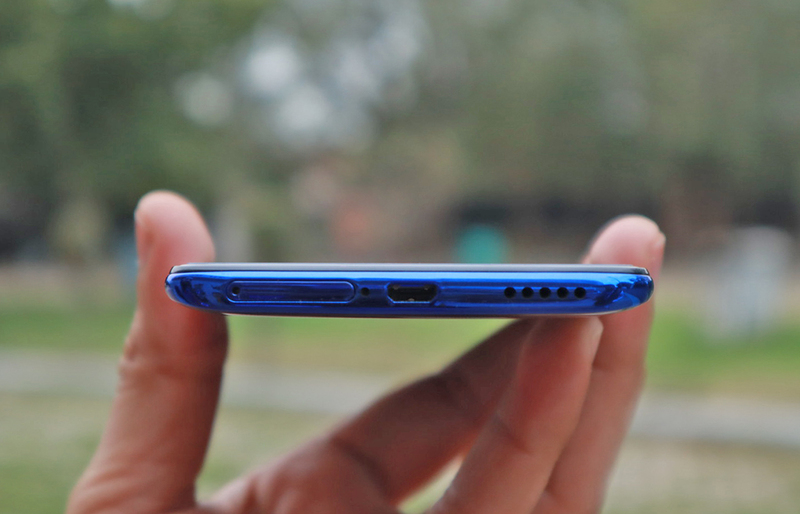 First, even as Vivo endorses that the device supports fast charging at 22.5W, it still uses a micro USB port which feels outdated on a premium-looking device like the V15 Pro. However, if you’re not bothered by the issues as much as I am, you can definitely find many other ways to admire the smartphone—and the cameras on both the front and the back shall definitely help you with that. 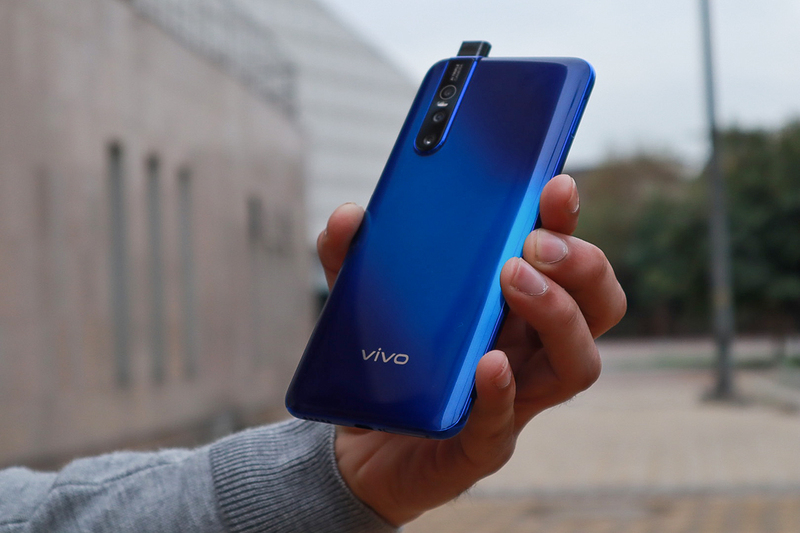 While its pop-up selfie camera is a spectacle of the company’s determination to inspire other brands, the triple cameras on the back of the Vivo V15 Pro also command a lot of attention. The smartphone features a 48MP sensor, an 8MP wide-angle sensor, and a 5MP depth sensor. The images from the 48MP sensor are usually resized to one-fourth of the size (i.e. 12MP) using pixel binning, and this ensures more exposure and a greater amount of details in images. You can, however, also take images in 48MP if you wish to use larger images. On top of that, there’s AI scene detection which improves saturation by identifying the scene or object inside the frame. The camera struggles a bit in locking focus and this can result in blurred images when you’re moving. It does have noticeable lag while adjusting to changes in the exposure, although that can be fixed with an update in the future. The wide-angle sensor lets you capture a wider area but that also results in poorer colors and lower quality. As you can see in the images below, the image clicked with the wide-angle sensor is warmer and appears washed out in comparison to the image clicked with the main 48MP sensor of the Vivo V15 Pro. However, there is no warping effect as we see on Google Pixel 3’s wide-angle front camera or the dedicated wide-angle sensor on the Samsung Galaxy A9. In terms of selfies, the 32MP camera does fairly well. Outdoors, the images are very sharp with a striking balance between colors and details. But indoors, the single selfie camera jeopardizes details to ensure decent exposure in the images. 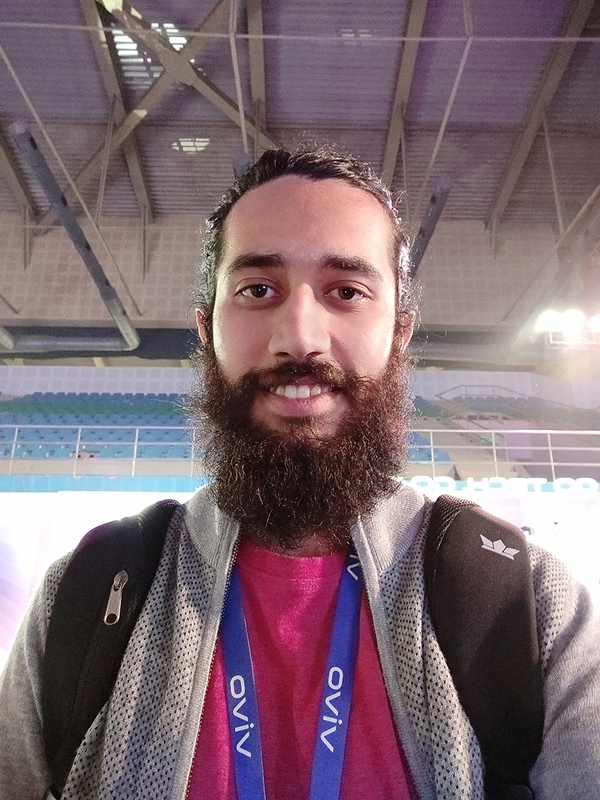 Vivo V15 Pro also has a dedicated mode for AI Selfies. While the mode enhances colors in most cases, it spoils certain images by trying to maintain a uniform color temperature throughout the image besides over-smoothening the skin. However, I’d be able to judge the produced images better only after reviewing the Vivo V15 Pro’s camera in depth. Lastly, the Vivo V15 Pro’s camera has many features, and this could be confusing to certain users. Apart from the modes mentioned above, the smartphone’s camera is equipped with a dedicated night mode, AR stickers, support for 4K video at 30fps, and slow-motion video at 240fps. You also find a shortcut for Jovi, the aforementioned shopping assistant from Vivo, within the camera app. In my initial impressions of the Vivo V15 Pro’s camera, I have liked the camera so far, especially considering the price. Overall, the performance of the camera has left me with the urge to try it out extensively before coming to a conclusion, although I’m already leaning in its favor. The UI and the overall user experience of the Vivo V15 Pro is the only thing that makes me feel skeptical of the device. The smartphone runs on Android 9 Pie-based Funtouch OS 9, which feels like an unfitting blend of Android and iOS. The absence of an app drawer, a significant amount of bloatware, challenging gestures, and the quick settings pane inspired by the obsolete iOS 10 are things that are likely to dissatisfy most Android power users. If you can either ignore or accept these attributes, then the heavily skinned interface might work out for you. For others, there may be an option to use custom ROMs which would allow users to customize the interface, and thus, have a better experience than what Vivo V15 Pro’s current UI offers. Sure, the Vivo V15 Pro comes with its share of issues like any other device, but overall, it offers great utility for anyone who does not demand flagship grade performance. The V15 Pro has a gorgeous and attractive design as well as a rich and vibrant Super AMOLED display. The cameras, too, seem to be very promising and we can’t wait to test their full potential. Meanwhile, things like the micro USB port and Vivo’s custom skin on top of Android Pie can be disheartening for some users. The V15 Pro is currently limited to India with no details about availability outside the country. You can pre-book the device either on Amazon or Flipkart or wait until March 6 when it will be available for sale both online and in offline stores for a price of ₹28,990 ($410) for the 6GB RAM and 128GB variant. While the previously tipped 8GB RAM variant missed the launch, we can expect it to be introduced in near future. While we’re working on a full review of the Vivo V15 Pro, you can check out what our friends at Pocketnow think about the device.